Before and after. Photo via femaleworld.it, shared under Creative Commons license. As soon as a nuclear agreement was signed in Vienna between Iran and the so-called P5+1 countries putting an end to the trade sanctions against the Islamic Republic, the visits of western industrialists and political representatives looking for contracts  began in Tehran. Then it was Iranian President Hassan Rouhani ‘s turn to visit European countries, accompanied by six ministers and 120 entrepreneurs of various economic sectors. He concluded his first stop-over in Rome, signing contracts for a total value of more than 17 billions euros  in a wide range of sectors. This official visit in the Italian capital aimed to strengthen the relationship between Italy and Iran after the end of the sanctions. 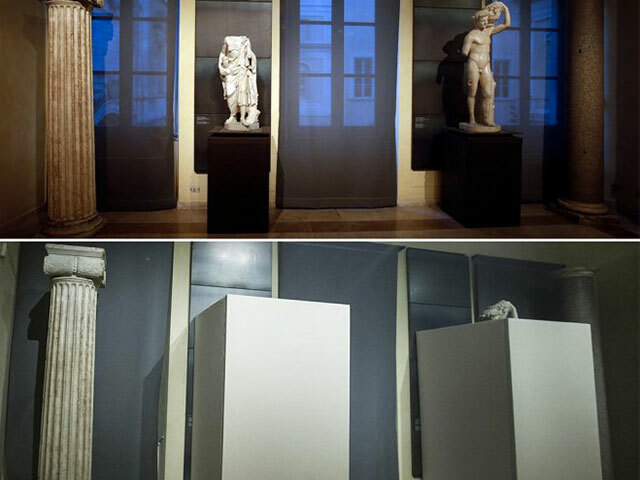 A gesture of “respect” towards Iran, however, seemed to undermine that very relationship, at least in the public's eyes: Many naked sculptures in the Capitoline Museums were covered up by large white panels so as “to not offend the sensitivity of the Iranian President”, as Italian news website Ansa  explained. The covering was decided on as a form of respect for Iranian culture and sensitivity. In fact, during the institutional ceremonies even wine was been served. This is the first visit in Europe after the end of the sanctions against Tehran, thanks to the nuclear agreement that Rohani himself considers “a political miracle”. But this visit generated debate over the welcome given to a government that leads the black lists regarding human rights. “We demonstrated that we could talk and discuss even topics where the distance between our stances is huge, like human rights,” said Prime Minister Matteo Renzi. Gianni Ruffini, general manager of Amnesty International Italy, had invited Renzi to talk about these problems, especially about the massive number of death sentences in Iran, citing thousands of cases that took place only in 2015. “Amore e Psiche” with the colors of the Italian flag. Image via Giovanni Pascali on Facebook. Free souls! Let's publish all the covered-up sculptures “Amore and Psyche” with the colors of the Italian flag, which by chance are the same as the Iranian ones. Against this psychos, may Love win! Rouhani and Mattarella agree on the necessity to strengthen cultural and academic cooperation. In order to confirm the interest that Iran has in Italy, one need only remember that the book fair that will take place in Tehran in 2017 will be dedicated to Italy. The person in this photo near the Prime Minister Matteo Renzi is Hassan Rouhani, the president of the Islamic Republic of Iran. During the meetings with President Sergio Mattarella and with Prime Minister Matteo Renzi, there has not been any mention of the lack of democracy in Iran and Rouhani has been introduced like a moderate and reformer president, while every day in Iran three people are sentenced to death. However, they did not talk about death sentences, hangings, torture, discrimination against women, the persecution of homosexuals and journalists. It is not acceptable that the people occupying the highest positions in our nation talk about “distance” with superficiality: dialogue is good, even necessary, but without censorship, without worrying about offending the sensibilities of a head of state who uses fear as a weapon. #Rohani in #Rome: naked sculptures covered in the Capitoline Museum. It is a shame to cover up our culture, where will end up? They are demented…it is like if the Statue of Liberty being covered if the Iranians visited. This wasn't the first instance of censorship of art over the fear of offending a high-profile figure. In June 2015, in Turin posters of an exhibition of Polish painter Tamara de Lempicka's work were covered,  too, because the event's location was deemed too close to the place where the Holy Shroud — a piece of cloth that some Christians believe to be the burial shroud of Jesus — is preserved and where Pope Francis was going to visit.